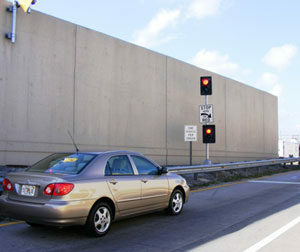 Ramp Signals are traffic lights that have been working to reduce congestion along northbound and southbound Interstate 95 (I-95) in Miami-Dade County. Ramp Signals are activated during times of heavy congestion, such as weekday rush-hour periods, but may also be activated in case a traffic incident or special event impacts regular expressway operations. The signals work based on real-time traffic conditions and alternate between red and green lights to control the rate which vehicles enter the highway. They break up the groups of merging vehicles to reduce the impacts of entering traffic to regulate the flow on the mainline. To date, Ramp signals have significantly improved mobility and travel speeds during the evening and morning rush hour periods by 16% and 11% respectively. How Does Ramp Signaling Work? When the signal is red: Pull up to the marked white line on the pavement before the “Stop Here on Red,” sign to activate the ramp meter light. When the signal light turns green: One or two vehicles, as indicated by the signage on the ramp, should proceed and merge onto the interstate. Be patient: A short wait at the ramp will help reduce your travel times and improve your commute along the mainline. Enforcement of Ramp Signaling is part of the 95 Express program. Drivers who fail to obey the traffic signals will be subject to penalties as permitted by law. For more information on Ramp Signaling, click here.